The higher your post appears, the better, as it will be more discoverable by people who don’t already follow you. This guide will teach you how to use hashtags to attract new followers, get more likes, and increase engagement. That means your content can end up in a users’ feed even if they don’t follow you. And if you’re sharing great content and tagging it with relevant hashtags, many of them will start following you. When a user follows a hashtag and sees something they don’t like they can select the “Don’t Show for This Hashtag” option. The feature is designed to teach the Instagram algorithm what content a particular user likes. No, there’s no such thing as the Instagram “shadowban.” But if too many of your posts are flagged, it’s reasonable to assume your content will be shown less often (or not at all). As for the practice of using the same long list of hashtags on every post… Don’t do it. Instagram’s community guidelines clearly state that “posting repetitive comments or content” is not okay. When you create a post, only use hashtags that make sense. If you tag a post with #wanderlust, for example, your content must be something globetrotters will want to comment on, like, and share. It’s not about getting seen by a lot of people, it’s about getting seen by the right people. That’s how hashtags lead to higher engagement and more followers. 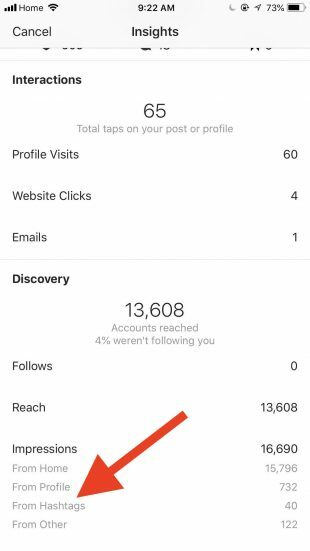 If you’ve made the switch to an Instagram business profile, you have access to post insights which tell you how many impressions you received from hashtags. Select the post you want data on and tap View Insights below the post on the left. Swipe up to see all the insights for that post, including the number of impressions from hashtags. By tracking this data you can begin to figure out which hashtags are most effective for improving reach. Hashtag pages have an Instagram Story icon in the top left corner. Click on it and you’ll see a collection of Stories posts tagged with the hashtag from people with public profiles. If you’re lucky enough to get your post in a hashtag Story, you can expose your brand to a large audience. 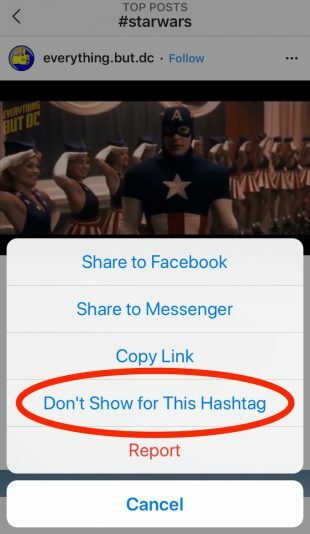 There are two ways to add hashtags to your Stories. The first method is by using the hashtag sticker and changing the text. Or you can simply use the text tool and the # symbol to type out the hashtag the same way you would on a photo or video post. You can add up to 10 hashtags on a Story, but take care not to clutter your content. You can shrink your hashtags or even hide them behind an emoji, sticker, or GIF. And when a user taps it they will be taken to that hashtag’s page to follow it. For businesses with popular branded hashtags (more on that later), it’s a great way to foster engagement or collect user-generated content. If you try and use more, your comment or caption won’t post. If you leave a hashtag below someone else’s post will your brilliant comment be more discoverable? No. The hashtags you want to use will depend on what space your business operates in. Let’s say you’re a social media manager for a travel agency. There are a ton of hashtags that are popular with jet-setters: #welltravelled, #justbackfrom, #whatsinmybag, and #passportexpress—to name a few. Tag your posts with any number of these and you will likely get a few extra likes. But if you really want to increase engagement and gain quality followers, include more specific hashtags. If you post a photo of a travel destination, tag it with relevant location hashtags and the resort’s branded hashtag (if there is one). How do you find out which hashtags your audience is already following? Here are a few tips to help you answer that question. Maybe you’ll discover new hashtags to add to your repertoire. Or you could decide you don’t want to compete for the same eyeballs, in which case you can search for alternative hashtags to use. These people are already well-established with your audience, so why not learn from the best? 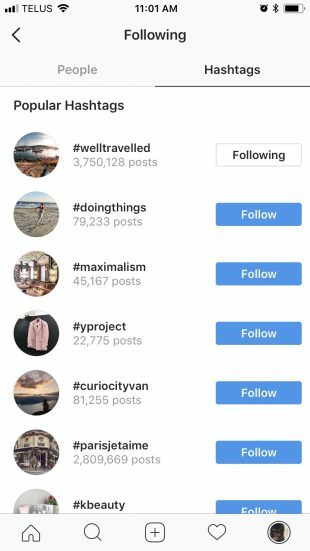 Type a keyword that’s relevant to your brand into Instagram’s search bar (a.k.a the Explore feature) then select the Tags tab. 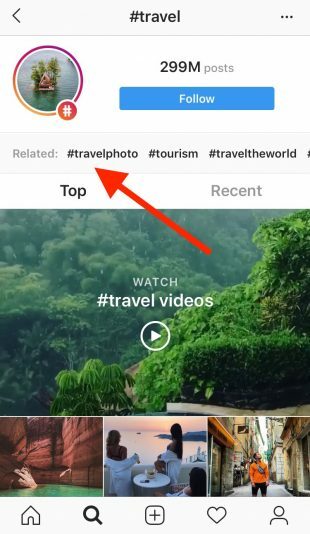 Instagram will give you a list of all the hashtags with that keyword, as well as a number of posts that are tagged with it. A large number may mean lots of people following that hashtag, but it also means there’s a ton of content on it and your posts might get lost. Experiment with a combination of popular and niche hashtags to find your brand’s sweet spot. 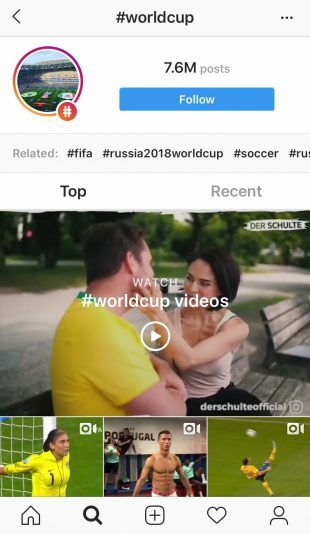 On any hashtag page, right above the “Top” and “Recent” tabs, you’ll find a list of related hashtags that you can scroll through by swiping left. This is a great way to find relevant hashtags that might be a bit more niche. And that means an even more targeted audience with less content to compete with. Browse through posts containing a hashtag you’re already having success with. Do you see a trend of other common hashtags that could be included in future posts? When it comes to choosing Instagram hashtags, the golden rule is: use only hashtags that are relevant to your brand, industry, and audience. #Love is one of the most popular hashtags on Instagram, tagged in over 1.3 billion posts. But your company is not going to attract those hashtag followers if you attach it to a photo of your boring boardroom. Again, if you tag your photos with popular, but unrelated hashtags, you might be flagged as a spammer. Let’s review what we’ve learned so far, plus a few more strategies to help you achieve your Instagram goals. Hashtags must be used strategically. You will only increase engagement if you give the audience what they’re looking for, i.e., quality content that speaks to their interests. 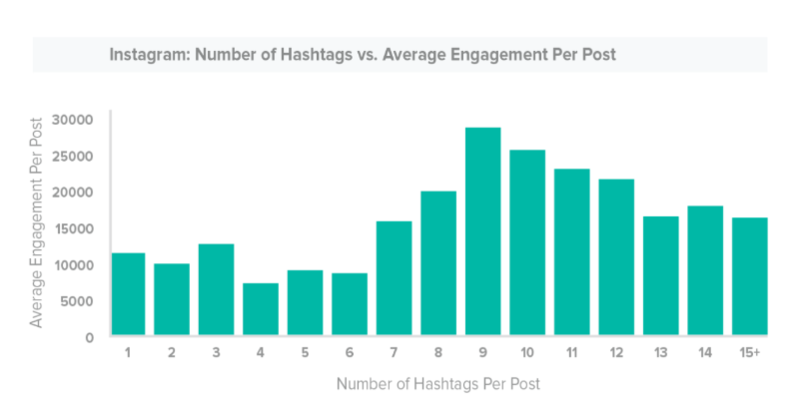 According to an analysis by TrackMaven, posts with nine hashtags receive the most engagement. But that doesn’t mean you should tag every post with a lot of hashtags. Again, they must be relevant to the content. Using a popular hashtag like #followmeback might get you a few new followers, but they’ll likely be the wrong kind—spammers or people looking to inflate their own follower count. These people will not engage with your brand. The content of your posts must inform what and how many hashtags you use. As long as they’re relevant to the post and used sparingly, popular hashtags can help expand your reach without making you seem desperate or spammy. We list some of the most popular hashtags at the end of this article with tips on how to use them responsibly. You don’t want to inadvertently attach your brand to a raunchy or nefarious campaign. When you combine two or three words together, does it spell out something else? There’s a pretty famous example of this from 2012. Susan Boyle had a new album out, and the hashtag to promote it used the phrase “Susan album party.” And without spaces some people thought “Su’s” party was of a very different sort. Before using any hashtag, be sure to browse through the hashtag page to ensure the associated content is appropriate. Don’t clutter your content. Keep the reader focused on what’s important: your compelling caption. You can also bury your hashtags within the caption itself. If you want to add hashtags to a post you’ve already uploaded, tap the three dots in the top right corner of your screen and select Edit to add to the caption. Again, you can also add hashtags post-publishing by tapping the speech bubble under the photo and typing the hashtags in as a comment. A brand (or branded, if you prefer) hashtag is one that’s unique to your company or campaign. It could be as simple as your business name, tagline, or name of one of your products. Herschel Supply Co. uses a few branded hashtags, including #herschelsupply and #welltravelled. The latter was created for a campaign to encourage customers to share travel photos featuring Herschel products. Now tagged in millions of posts, it is often cited as one of the most popular travel hashtags on Instagram. Like Herschel, you can create a brand hashtag for a specific campaign or to simply showcase your company culture, products, or services. If you’re running an Instagram campaign, having a brand hashtag will help drive participation and engagement. It will also organize all the posts that are tagged with it on a hashtag page. This is helpful if you’re using the hashtag to collect entries for a promotion or contest submissions. Or you can use branded hashtags to simply promote your company—the people, wins, and culture. At Hootsuite, we use #HootsuiteLife for that purpose. That way your fans and customers can easily remember it. You want to be specific, but something like #SanFranciscoLuxuryCarEnthusiasts for a high-end auto show won’t catch on because it has too many characters. “#SFCarLovers” makes more sense in this case. In addition to numbers and letters, emoji can be include in hashtags (spaces and special characters, such as % or $, don’t work). These animated icons are eye-catching and, because they can stand in for entire words, will keep your hashtags short. No matter how popular they may be, you should avoid hashtags that shamelessly solicit likes and followers—#followme, #like4like, #follow4follow, #tagsforlikes, etc. Using these will attract bots, spammers, and others users who have no intention of engaging with you in any meaningful way. They also show your followers that your brand is okay with engaging in spammy behaviour. And that’s not a good look. But again, that doesn’t mean you should ignore every popular hashtag. Tagged in over 428 million posts, #TBT (Throwback Thursday) is one of the most used hashtags on Instagram and a perfect nostalgia marketing opportunity. If your brand has a past, use #TBT to share it. If your brand is newer, you can use the hashtag to dig into the history of your products or industry. #instagood: Use this on photos you’re particularly proud of. #photooftheday: Also reserved for your best work. There’s an associated @photooftheday Instagram account that selects one “winning” photo with the hashtag each day and shares it with their more than 269,000 followers. #picoftheday: Same concept as above. #instagrammers: Popular with Instagram influencers and other power users. #igers: Short form of #instagrammers. #instamood: Intended to be used in photos that reflect the publisher’s mood. Typically #instamood posts are not of people, but scenery. So if your brand is celebrating a big win, then you could post a photo of a fireworks display. #TBT (and #ThrowbackThursday, the longer and less frequently used version): As noted above, this all about nostalgia marketing. For more, check out our guide to using #TBT to promote your brand. #FBF or #FlashbackFriday: Because one day a week dedicated to nostalgia isn’t enough. The concept is the same as #TBT, although the Friday tag isn’t as popular. #ManicMonday: Use on posts that illustrate your busy week ahead or wacky company culture. #WisdomWednesday: Post a quote or piece advice that your target audience will find helpful. #FridayFunday: A chance to humanize your brand and entertain your audience with some lighter content. Want more daily hashtags for contest inspiration? Check out our complete list. #NoFilter: For photography purists. Use on posts that you haven’t applied a filter to. #selfie: Self explanatory. As a social media marketer, you can use this hashtag when you’re representing your brand at an industry event. #regram: Use this when reposting a photo from someone else’s account to your own. Make it a part of your user-generated content strategy. 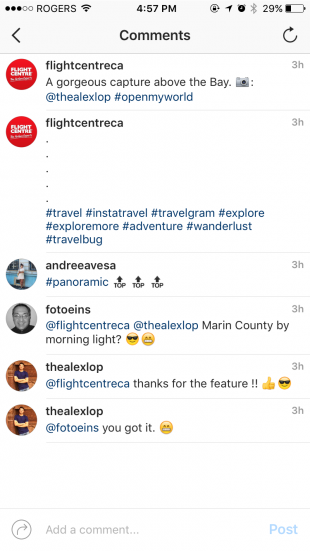 To learn how, check out our tips for reposting content on Instagram. #contest, #giveaway, #sweepstakes, etc. : Use these if you’re looking to give something away to full-time contest contestants. Hopefully the winner will share their prize and promote your brand with their audience. There are of course popular Instagram hashtags specific to each industry. Real estate, for example, has: #realestate, #architecture, #realestateforsale, and #realestatephotograhpy. To surface the ones that are relevant to your business, refer back to our tips on how to find the right hashtags. Okay, so, the key takeaway: Be thoughtful about how and which hashtags you use. Like any type of content you share on social media, it’s all about the audience. What value are you offering? What’s in it for them? Why will they be compelled to engage with your post? If you don’t have an answer, don’t share. The post The 2019 Instagram Hashtag Guide—How to Use Them and Get Results appeared first on Hootsuite Social Media Management.